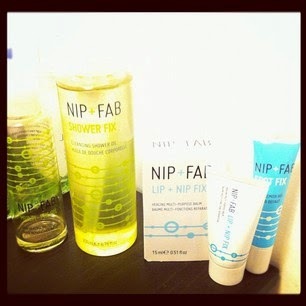 I am becoming a big fan of the Nip & Fab range, created Maria Hatzistefanis who is more famous for creating the product range Rodial - results driven products which you need to take a mortgage out to be able to afford. But she's now used the same techniques to create a more affordable range for the masses, which is proving as popular in the world of celebrity as the bank-busting Rodial range. John Lewis and Boots both sell these products, and you'll regularly see them in the 3 for 2 promotions at Boots. My favourite products so far are the Multi-Fix Oil, which I use as a body moisturiser, Multi-Fix Balm which is a good lip balm or to moisturise your dry cuticles, and the Cleansing Shower Oil. The spot gel is also worth a go.